Have You Completed Your Hazardous Materials Management Plan? A wide variety of federal, state and even local laws apply environmental, health and safety (EH&S) protection requirements to chemicals. EH&S compliance personnel are accustomed to complying with chemical management requirements imposed by the Environmental Protection Agency (EPA), Occupational Safety and Health Administration (OSHA), and their state equivalents. In addition, however, organizations that concern themselves with EPA and OSHA must also concern themselves with chemical management requirements imposed by their local fire codes that govern building and fire safety. Buildings and facilities in most states are subject to local codes. These codes require that building construction and operation incorporate design features that address potential hazards—including “hazardous materials” that present physical or health hazards—but these are not limited to fire extinguishers and “rated” structures. Since the 1980s, facilities in California have had to comply with additional fire code requirements to devise and implement hazardous materials management plans (HMMPs), and to submit hazardous materials inventory statements (HMISs) to their fire departments. These began as local initiatives in Silicon Valley, spread to western states, and in recent years have been incorporated into the IFC. As states have adopted the IFC, facilities throughout the country may now be required to incorporate these requirements into their broader EH&S compliance requirements. Types of facilities (underground tanks, semiconductor fabrication lines, etc.). Types of material present (explosives, flammable liquids and gases, etc.). How the materials are used (storage, use in enclosed processes, use in open containers, etc.). Classes of fire prevention equipment (sprinklers, storage cabinets, etc.). Water-reactive materials solids or liquids. 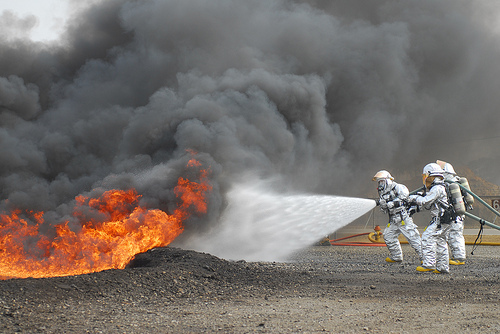 Each facility that handles or stores hazardous materials may be required by its local fire agency to obtain a permit (determined locally based on type and quantities of materials) and may be required to submit a Hazardous Materials Management Plan (HMMP) and a Hazardous Materials Inventory Statement (HMIS). Maximum quantity onsite at any time during the reporting period (typically annual). HMIS – OSHA Hazard Communication Standard (HCS); Emergency Planning and Community Right-to-Know Act inventories and Tier II reports. Site plan – required by many EH&S requirements for routine operations and emergency response planning provisions (e.g., OSHA Emergency Action Plans (EAPs) and Fire Prevention Plans;; Clean Water Act Spill Prevention, Control and Countermeasure (SPCC) Plans). Building floor plans – required by many EH&S requirements for routine operations and emergency planning and/or response. Descriptions of hazardous materials handling – most EH&S requirements. Chemical compatibility and safety precautions – OSHA standards; RCRA; DOT. Monitoring of each storage facility – most EH&S requirements. Security precautions – OSHA standards; RCRA; DOT; Department of Homeland Security Chemical Facility Anti-Terrorism Standards (CFATS). Onsite emergency equipment – required by response planning requirements. Employee safety training – most EH&S requirements. Inspection and record keeping – most EH&S standards. Because fire codes contain local variations, and are not always updated annually, each facility that handles potentially hazardous chemicals and other materials may be subject to unique local requirements. Do any of the organization’s facilities handle chemicals regulated as hazardous by any EH&S regulatory compliance programs? If so, has each such facility identified its local fire protection agency? If so, has each such facility reviewed applicable fire code requirements, to identify requirements applicable to the facility’s chemical and material inventories, and activities that use any of these chemicals? If the facility is required to prepare an HMMP and HMIS, has it done so? When was the last update filed? Does the facility review hazardous chemical/material handling – periodically, and whenever there are changes to on-site activities that involve hazardous chemicals/materials? If the facility is required to prepare and implement an HMMP, does it coordinate these compliance activities with other applicable EH&S requirements? If so, how is this coordination accomplished?